U.S. crude prices rise back above $70 a barrel for the first time in a week. The oil market is getting support from rising tensions in the Middle East, an ongoing heavy crude outage in Canada and easing U.S.-EU trade tensions. OPEC is forecast to have raised output by 70,000 barrels a day in July, a smaller increase than the cartel managed in June. 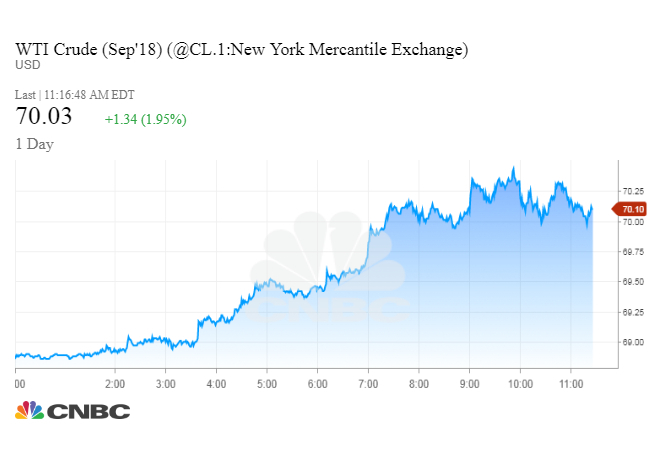 Oil prices rose back above $70 a barrel on Monday, with U.S. crude posting its best one-day dollar gain in over a month, after four weeks of losses for the benchmark. U.S. West Texas Intermediate crude ended Monday's session up $1.44, or 2.1 percent, to $70.13 a barrel. While the contract has risen in seven of the last previous 10 sessions, it has not posted a gain of more than $1 a barrel since June 27. As of Friday, WTI was down more than 7 percent over the last four weeks, as heavy losses in a handful of trading sessions wiped out a string of modest daily gains for the benchmark. The contract to deliver international benchmark Brent crude for September was up 83 cents, or 1.1 percent, at $75.12 a barrel by 2:08 p.m. ET. The September contract expires on Tuesday. Trading was heavier for the October contract, which is up 97 cents, or 1.3 percent, at $75.73. Prices got support after Saudi Arabia announced it would suspend shipments of oil through the critical Bab el-Mandeb Strait, after Houthi rebels in Yemen attacked a pair of oil tankers in the Red Sea. The Saudis have led a military coalition against the Iran-aligned Houthis for more than three years. Risk consultancy the Eurasia Group says the attack on the tankers "represents a serious escalation in dynamics around the Yemen conflict." "While Houthi rebels probably long possessed the capability to threaten Saudi oil shipments in the Bab-al Mandab Strait, their willingness to use it is the result of rising tensions in the region," Ayham Kamel, head of Eurasia Group's Middle East and North Africa practice said in a research note, using an alternative spelling for the strait. "The attack was probably encouraged by the Iranian leadership to demonstrate to the US, Saudi Arabia, and Israel that Iran and its allies retain a capacity to respond to intensifying economic, political, and military pressure." The United States and Iran have lately engaged in a war of words, with Iranian officials threatening to snarl oil exports in the world's busiest region for crude shipments. Tension is rising ahead of the first of two deadlines next week for international businesses to wind down ties with Iran under renewed U.S. sanctions. The situation raises concerns that the world will be short of oil. Those concerns have been amplified as Canada's Suncor Energy works to fully restore operations at its massive Syncrude oil sands facility, where supplies have been disrupted by a power outage earlier this year. The company has scaled back its expectations for production from Syncrude this year, and there are reports the facility might not be fully operational as early as expected. "It's just this witches' brew of supportive factors from Iran to the Syncrude," said John Kilduff, founding partner at energy hedge fund Again Capital. Hedge funds and money managers are getting more constructive on energy commodities. Funds increased their bullish bets in Brent, U.S. gasoline, U.S. heating oil and European gasoil in the latest week, according to a Reuters analysis. While the funds trimmed their bullish bets on WTI, the number of wagers that U.S. crude prices will fall remains depressed. A Reuters survey indicates that the 15-member OPEC oil cartel increased output by 70,000 barrels per day in July. That would mark a slowdown in production growth from June, when the group hiked production by 173,000 bpd. OPEC is seeking to add supplies to the market to prevent prices from rising too quickly and denting demand. Fears that robust demand for oil will cool off have eased following a meeting between President Donald Trump and European Commission President Jean-Claude Juncker that yielded progress in a trade dispute last week. However, an escalating trade battle between the United States and China continues to threaten economic growth prospects, which would weigh on oil consumption.